Emma Stone wore a single sleeved gold blouse with a bow at the neckline, paired with some wide legged black trousers. He red hair was parted to the side and pulled back, and she wore some gorgeous dangly gold earrings. Emma was nominated for two SAG Awards this year, one for her role in The Favourite and one for her role in Maniac. While Emma didn’t win in either category, I think she won best dressed. Amy Adams was also nominated for two SAG Awards (I’m sensing a trend here), one for Outstanding Performance by a Female Actor in a Television Movie or Miniseries for Sharp Objects, and one for Outstanding Performance by a Female Actor in a Supporting Role for Vice. Amy showed up to the Awards in this little black dress with a unique silhouette. I’m not sure if this peplum look is the most flattering on her, but she’s also Amy Adams, so she can do no wrong. While Emily Osment didn’t receive any individual SAG Award nominations this year, her show, The Kominsky Method, was nominated for Outstanding Performance by an Ensemble in a Comedy Series. The cast of the show didn’t end up taking home the award, but Emily still looked stunning in this floor length pleated red dress. Emily looks like a classic Hollywood beauty. This dress is super flattering on her and I’m loving her new shorter haircut. Rachel Bloom of Crazy Ex-Girlfriend fame went for a taupe toga style dress for this year’s SAG Awards. She’s gone for a real matchy-matchy vibe with taupe shoes and a taupe clutch. I think Rachel looks amazing in this dress and that the cut of the garment is really working wonders for her figure. I love her side-swept hair and subtle makeup. Rachel wasn’t nominated for a SAG Award this year. This year, Timothee Chalamet was nominated for a SAG Award for Outstanding Performance by a Male Actor in a Supporting Role for his work in Beautiful Boy. Ultimately, the award went to Mahershala Ali for Green Book, but Timothee still slayed on the grey carpet. I’m loving this black on black on black look. The leather pants are amazing, and the polka-dot shirt is definitely going to start a spring trend. 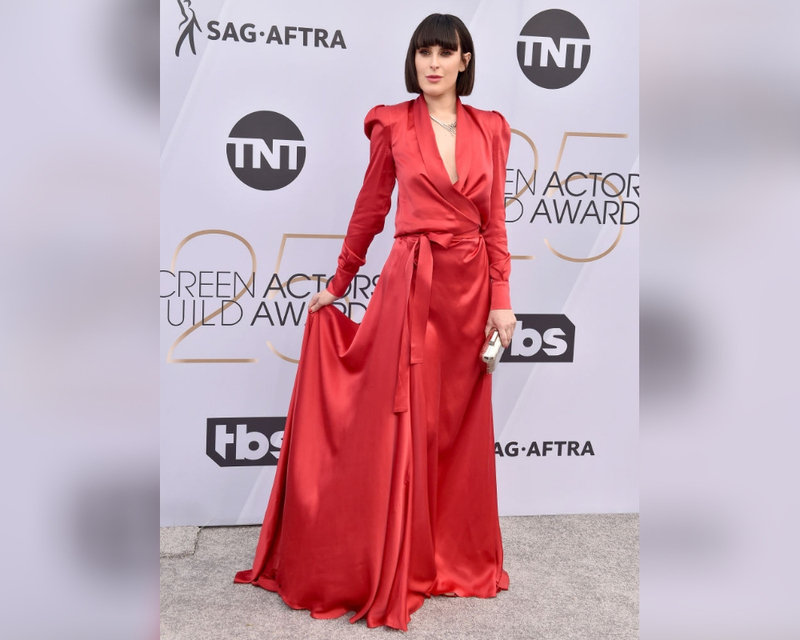 While most of the SAG attendees opted for warm spring colors this year, Rachel Brosnahan decided that she wanted to match the carpet. The periwinkle dress has tons of cool detailing, like the delicate floral pattern through the fabric and the four horizontal bands around the bodice. Rachel Brosnahan won a SAG Award this year for Outstanding Performance by a Female Actor in a Comedy Series for her work in The Marvelous Mrs. Maisel. Alison Brie looks like a gothic angel in this sleek black dress with a wing-like cape and bow appliqués. Alison was nominated for a SAG Award for Outstanding Performance by a Female Actor in a Comedy Series for her work on Glow. The cast of Glow was also nominated for Outstanding Performance by an Ensemble in a Comedy Series. Unfortunately for Alison, her show was beat out by The Marvelous Mrs. Maisel in both categories. This year, Elisabeth Moss was nominated for a SAG Award forOutstanding Performance by a Female Actor in a Drama Series for her portrayal of Offred, AKA June, in The Handmaid’s Tale. Elisabeth showed up to the awards in this stunning textured cream ballgown with a black sash at her natural waist. She wore her blonde hair down and opted for more neutral makeup. Elisabeth looks like an actual bride in this dress. Black-ish star Yara Shahidi showed up to the SAG Awards in this rose gold bodysuit with a sheer tulle overlay. This outfit is absolutely perfect for Yara. It’s young, it’s hip, and it’s something only she could pull off. Yara’s eye makeup perfectly matches her dress, and I love the way she decided to wear her hair. Yara wasn’t nominated for a SAG Award this year, but if she keeps going at the rate she’s going, it won’t be long before she’s back here with a whole bunch of nominations. Rumor Willis’s draped satin red dress combined with her angular dark hair cut makes for an edgy yet classy look. I love the low neckline, matching nails and lips, and perfectly placed statement necklace. You don’t see long sleeved dresses on the carpet very often, so I’m glad that Rumor is here to bring us some variety. Even though Rumor is pretty covered up in this dress, the dress isn’t too conservative at all. While Laura Harrier wasn’t nominated for any individual SAG Awards this year, she was part of the BlackKklansman ensemble which was nominated for Outstanding Performance by a Cast in a Motion Picture. Laura looks like a breath of fresh air in this bright pink dress with off the shoulder puffy sleeves. This is how you dress like a young Hollywood starlet. Laura is doing everything right. I love that her lipstick matches her dress. You probably know Madeline Brewer as Ofwarren in the apocalyptic drama series, The Handmaid’s Tale. While Madeline wasn’t nominated for any individual SAG Awards, the cast of The Handmaid’s Tale was nominated for Outstanding Performance by an Ensemble in a Drama Series. Madeline’s fitted red lace mermaid dress is unlike anything I’ve ever seen on the grey carpet before. It’s great when actors step outside the box and invent their own personal style. Lucy Boynton played Mary Austin in Bohemian Rhapsody. While she wasn’t nominated for any individual SAG Awards, Bohemian Rhapsody was nominated for Outstanding Performance by a Cast in a Motion Picture. I absolutely love Lucy Boynton’s outfit. It has a rock and roll vibe that totally suits the film she’s there to represent. I love the juxtaposition between the feminine floral dress and harsher black polka-dot overlay. Mixing styles always adds more visual interest. Sterling K. Brown (AKA Randal in This Is Us) and his wife, Ryan Michelle Bathe, showed up to the SAG Awards in style. Sterling wore a classic black tuxedo, and Ryan wore a bejeweled mermaid style dress. Sterling K. Brown was nominated for a SAG Award for Outstanding Performance by a Male Actor in a Drama Series. Unfortunately for him, he lost to Jason Bateman for his role in Ozark. While Sydney Sweeney wasn’t nominated for any individual SAG Awards this year, she did appear in three shows which were nominated in multiple categories. Sydney played Eden in The Handmaid’s Tale, Alice in Sharp Objects, and Missy in Maniac. This woman definitely knows how to choose a good project. Apparently, she also knows how to choose a good dress. I love this coral and white outfit. Sydney looks like she’s ready for spring. You probably know Aja Naomi King best from her work on Scandal alongside Viola Davis. Aja wasn’t nominated for a SAG Award this year, but that didn’t stop her from showing up to the event in style. Aja decided to bring the sunshine to the SAG Awards in this gorgeous yellow dress. I love the strappy details around the neckline and that super high slit. Aja definitely knows how to stand out in a crowd. Speaking of yellow, Susan Kelechi Watson may have actually outdone Aja Naomi King. Both dresses are beautiful, but this one is definitely a showstopper. I love the layers of tulle on this dress combined with the very bare and minimal top half. Susan looks like a modern-day Disney princess. Susan and her castmates won the SAG Award for Outstanding Performance by an Ensemble in a Drama Series this year for their work on This Is Us. 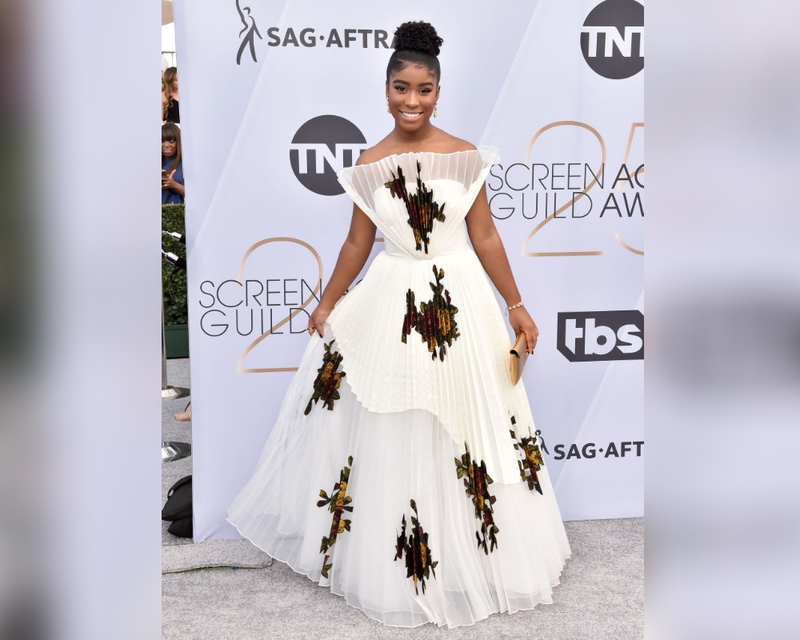 Lyric Ross plays Deja on This Is Us, so she was part of the cast that won the SAG Award for Outstanding Performance by an Ensemble in a Drama Series this year. Lyric showed up to the awards in this gorgeous pleated white dress with a floral pattern. The intricate neckline is anything but boring. 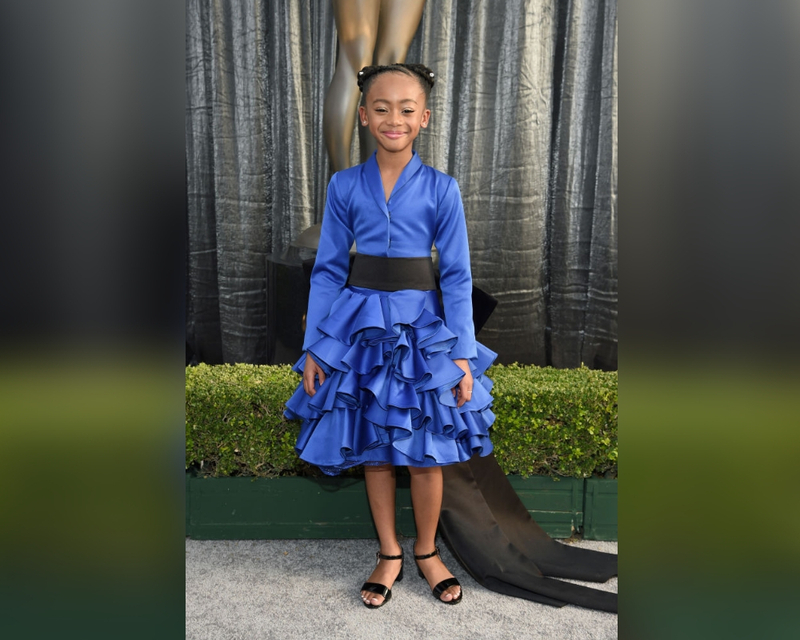 I can tell that this young lady is going to be serving us some serious fashion for years to come. Betty Gilpin looks like a true star in this tiered silver dress. Betty’s show Glow was nominated for a bunch of SAG Awards including Outstanding Performance by an Ensemble in a Comedy Series and Outstanding Action Performance by a Stunt Ensemble in a Comedy or Drama Series. The show actually ended up winning in the stunt ensemble category. Do you think that Betty did her own stunts on the show? 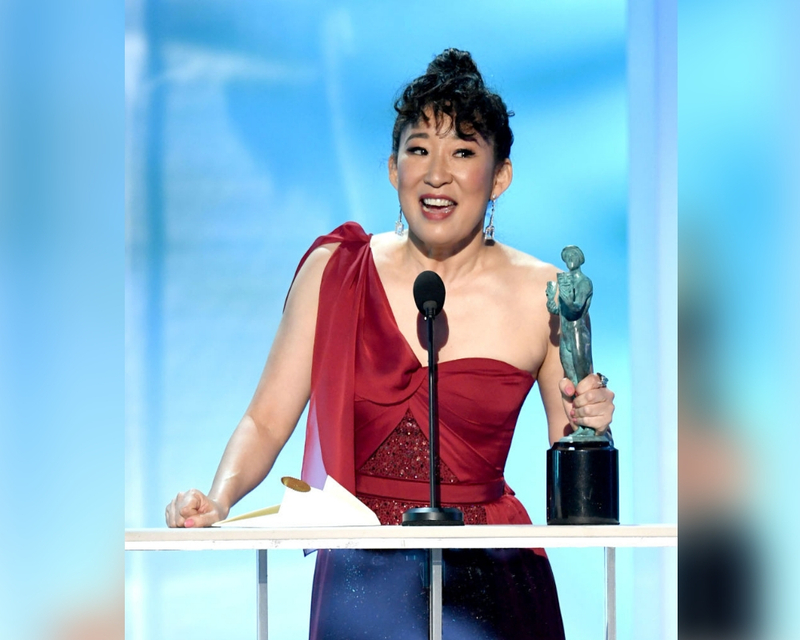 Sandra Oh was nominated for a SAG Award for Outstanding Performance by a Female Actor in a Drama Series this year, and she ended up winning in her category. Yay Sandra Oh! She was absolutely fantastic in Killing Eve. Sandra’s red one-shoulder dress is stunning on her, and I love the textured panel in the middle of the dress. Sandra always looks amazing, but she was glowing while she was holding that little green statue. Ok, this might be the cutest award show look I’ve ever seen. Faithe C. Harman won a SAG Award as part of the This Is Us cast this year. She showed up to the awards in this long sleeved royal blue dress with a black sash and a ruffled knee-length skirt. This is the perfect dress for a little girl and Faithe looks amazing in it. I can’t wait to see what she wears next year. Michael Douglas made the wise decision to wear a classic black tuxedo to the SAG Awards this year. His wife, Catherine Zeta-Jones, chose a navy blue lace and sequin dress with a high slit and a plunging neckline. If there’s anything Catherine Zeta-Jones wears well, it’s a slinky dark dress. These two are basically Hollywood royalty and they definitely look the part. Michael Douglas was nominated for a SAG Award for Outstanding Performance by a Male Actor in a Comedy Series. Keltie Knight is a Canadian TV presenter and former professional dancer. She is now a correspondent for Entertainment Tonight. Even though Keltie was at the SAG Awards to cover the event, she still showed up in style. This long tasseled look is definitely something people are going to be talking about. I love this understated pink color, and I think the style of this outfit is totally unique. I love how Keltie isn’t afraid to stand out. While Mandy Moore won a SAG Award with her This Is Us cast for Outstanding Performance by an Ensemble in a Drama Series, she wasn’t even nominated for any individual awards. I think Mandy Moore is one of the best actors on This Is Us, so I’m not thrilled about the fact that she wasn’t recognized for her work in the same way as some of her male co-stars. Oh well, there’s always next year. Polka-dots seem to be a thing this season. First Timothee Chalamet, then Lucy Boynton, now Sophia Bush… I think spring is going to be a very polka-dotty season, and I’m definitely not mad about it. Sophia Bush looks like she stepped right out of Game of Thrones in this outfit— but a more modern and fashion-forward Game of Thrones. I love how this dress is dark in color but lightweight. Although Fiona Xie wasn’t nominated for any individual awards this year, she was part of the cast of Crazy Rich Asians that was nominated for Outstanding Performance by a Cast in a Motion Picture. Fiona looks like a real-life princess in this bold, multicolored tulle dress. I think Fiona probably had the most unique and celebratory dress at the SAG Awards this year. She’s definitely going to make multiple best-dressed lists. We’re used to seeing Lady Gaga in totally over the top outfits, but she chose something more subdued for the SAG Awards this year. Lady Gaga walked the grey carpet in this classic white dress with a frayed edge. She wore a statement choker and tied her blonde hair back into a bun. Lady Gaga was nominated for Outstanding Performance by a Female Actor in a Leading Role, but ultimately that SAG Award went to Glen Close. From the front, this red dress that Laverne Cox is wearing just looks like a normal red dress. This outfit is all about the back. Check out all those jewels cascading off her shoulders. Now that’s glamorous. Laverne did a little twirl to show off the back of her dress in this photo. While she wasn’t nominated for any SAG Awards this year, she and the cast of Orange Is the New Black have won an ensemble SAG Award in the past. D.J. Pierce, sometimes known as Shangela, became famous after appearing on Ru Paul’s Drag Race. He played the drag bar emcee in A Star Is Born. D.J. 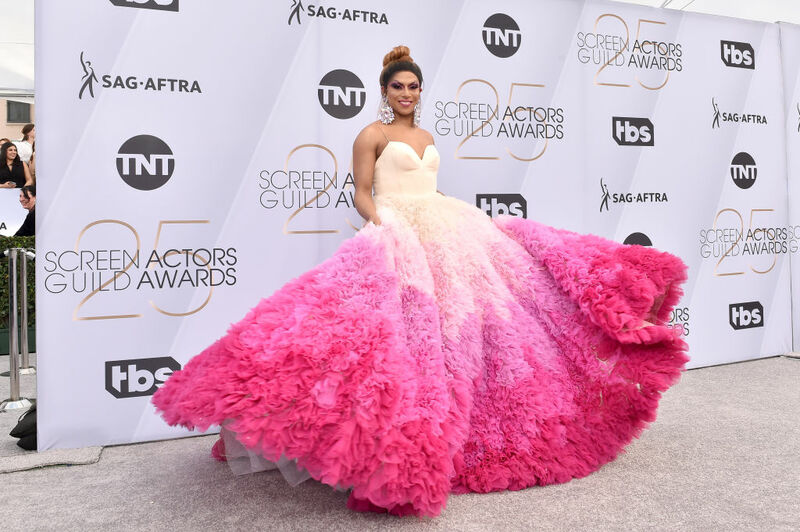 Pierce showed up to the SAG Awards in full Shangela mode. That ombre pink ballgown puts every other dress on this list to shame. It just goes to show, you shouldn’t even try to outdress a drag queen. It’s just not gonna happen, honey.